Sean Murray, founder of Hello Games, announced on social media that No Man’s Sky just went gold on 7th July 2016. He also mentioned that the game is ready for release and distribution. No Man’s Sky is an sci-fi adventure and survival game with a procedurally generated universe that contains 18 Quintilian planets. Each and every planet in the game got unique inhabitants, vegetation and landscapes. Fans and gamers around the world are anxiously waiting for No Man’s Sky’s release. I’m pretty sure that it will be the best game of the year. It’s happened. No Man’s Sky just went gold. I’m so incredibly proud of this tiny team. 4 years of emotions. 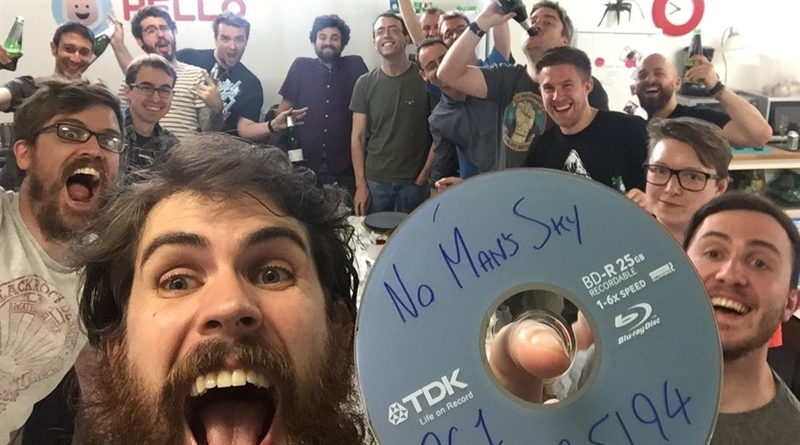 Sean Murray posted a picture of a small team at Hello Games celebrating with a first pressed disc that contains years of sweat, blood, tears and hard work. ‘Went gold’ is an industrial terminology for the developer producing the master copy of video games’ code. And sending master copy for replication and distribution ahead of the release date. But this does not prevent things such as day one patches. It indicates that a complete version of a game exists and is on its way to physical and digital stores and then ultimately into our hands. Hello Games were on an adventurous journey of its own. Since No Man’s Sky’s inception, development was a pretty long and winding road full of legal disputes and delays. The team rose above all adversity and is now proudly announces that No Man’s Sky is Ready for Release and it’ll be available on the PlayStation 4 and PC on 9th August 2016.